ADDISON. ELMHURST CHESS CLUB. Affiliate Type: Regular. SUN 6:30-11:00 PM. ELMHURST COLLEGE LIBRARY , ROOM 21 NORTH HALL , ELMHURST IL 60126 . Contact: ROGER BIRKELAND. (708) 832 - 1754. email: rogerb@elmhcx9.elmhurst.edu. ARLINGTON. ST JAMES SCHOOL. Affiliate Type: Scholastic. WED 3:30-4:30 PM. SCHOOL . Contact: MARY SCOTT. (847) 255 - 6746. ARLINGTON HEIGHTS. ST CHARLES CHESS CLUB. Affiliate Type: Regular. THURSDAY 7PM TO 11PM. BAKER COMMUNITY HOUSE , 101 S 2ND (RT31) . Contact: C/O JEFF WIEWEL. (847) 818 - 8913. AURORA. GWENDOLYN BROOKS ELEM SCH CC. Affiliate Type: Scholastic. SELECTED FRIDAYS 1PM. GWENDOLYN BROOKS ELEM SCH . Contact: GARY RAYMOND. (630) 978 - 9544. email: gary.chess@sysmaker.com. AURORA. AURORA CHRISTIAN SCHOOL. Affiliate Type: Scholastic. T,TH 3-4:30 PM. AURORA CHRISTIAN SCHOOL , 14 BLACKHAWK ST, AURORA . Contact: STEVE ANDERSON. (630) 892 - 1551. BELLEVILLE. ST CLAIR CHESS CLUB. Affiliate Type: Regular. THUR 6-10PM. ENGLISH'S BAR , 9735 W MAIN , BELLEVILLE IL . Contact: PAUL PETERSON. (618) 234 - 9302. BELLEVILLE. BELLEVILLE CHESS CLUB. Affiliate Type: Regular. THURSDAY 6:45-11:30 PM. SCHNUCKS , 2665 N ILLINOIS , SWANSEA, IL . Contact: DENNIS HUMPHRIES. (618) 233 - 1580. BELLEVILLE. BELLE VALLEY SCHOOL SOUTH. Affiliate Type: Scholastic. BELLEVILLE. GATEWAY CHESS LEAGUE. Affiliate Type: Scholastic. Contact: BRAD SCHMIDT. (618) 222 - 7666. BLOOMINGTON. STATE FARMS EMPLOYEE ACTIVITY. Affiliate Type: Regular. TUES 4-6. BARNS AND NOBLE . Contact: COLLEY KITSON. (309) 766 - 9493. BLOOMINGTON. TWIN CITY CHESS CLUB. Affiliate Type: Regular. 7PM TUESDAYS. LINCOLN LEISURE CENTER , BLOOMINGTON IL 61701 . Contact: DENNIS BOURGERIE. (309) 454 - 3842. BLOOMINGTON. HOLY TRINITY ELEM SCHOOL. Affiliate Type: Scholastic. 3-4 PM TUESDAYS. SCHOOL . Contact: CARL GAERTNER. (309) 662 - 3712. BLOOMINGTON. NORTHPOINT ELEM SCH CHESS CLUB. Affiliate Type: Scholastic. Contact: KATE RODRIGUEZ. BLOOMINGTON. STEVENSON SCHOOL. Affiliate Type: Scholastic. MON 3:15-4:15PM. STEVENSON GRADE SCHOOL , COLD LUNCH ROOM . Contact: JOHN BARE. (309) 663 - 2351. BLUE ISLAND. EISENHOWER HIGH SCHOOL. Affiliate Type: Scholastic. Contact: C/O PAUL KOENIG. BRADLEY. BRADLEY-BOURBONNAIS COMM HS. Affiliate Type: Scholastic. 7:30-8 M-F 304 1ST. ROOM 123 . Contact: JOHN HASSETT. (815) 937 - 3705. CHAMPAIGN. PARKLAND COLLEGE CHESS CLUB. Affiliate Type: College. 4-6 PM MON & WED. PARKALND COLLEGE , ROOM B-124 , 2400 W BRADLEY, CHAMPAIGN, IL . Contact: RAHEEM M ALI. (217) 351 - 2200. CHICAGO. CHICAGO LAND COMM CHESS CLUB. Affiliate Type: Regular. TUESDAY--6PM-11PM. KOEHNEKE COMMUNITY CTR , CONCORDIA UNIVERSITY , RIVER FOREST,IL . Contact: HOWARD FRIED. (773) 889 - 8553. CHICAGO. TULEY PARK CHESS CLUB. Affiliate Type: Regular. FREQUENT SATURDAYS. TULEY PARK , 501 E 90TH PLACE . Contact: THOMAS FINEBERG. (773) 721 - 3979. CHICAGO. WICKER PARK CHESS CLUB. Affiliate Type: Regular. WED 7:30PM. MYOPIC BOOKS , 1468 N MILWAUKEE AVE. , CHICAGO, IL 60622 . Contact: C/O PATRICK JONES. (773) 772 - 1369. CHICAGO. CHESS WIZARDS. Affiliate Type: Regular. Contact: C/O VALENTINA LOKHOVA. CHICAGO. LAKEVIEW CHESS CLUB. Affiliate Type: Regular. THURSDAYS 7-10 PM. JAVA CHA CAFE , 3415 N CLARK STREET , CHICAGO, IL . Contact: LANCE HOFFMAN. (773) 528 - 9804. CHICAGO. THE SOUTH SUBURBAN CHESS CLUB. Affiliate Type: Regular. FRI 7-11. OAKVIEW REC . Contact: C/O JOE BANNON. (773) 445 - 0631. CHICAGO. LAKEVIEW CUYLER CHESS CLUB. Affiliate Type: Regular. (EXT 12) WED 7-10PM. CUYLER FELLOWSHIP HALL , 3901 N MARSHFIELD , CHICAGO, IL . Contact: DREW MORISSEE. (312) 494 - 1300. email: drew@metrochess.com. This club offers: USCF Rated Events , Casual Play , Equipment , Under 18 Permitted , Refreshments , Lessons , Beginners Welcomed Additional Information: Join Us! CHICAGO. BROADWAY. Affiliate Type: Regular. Contact: C/O BAJRAMOVIC EHES. CHICAGO. COOK COUNTY CHESS PLAYER. Affiliate Type: Regular. Contact: C/O ESSIEMINA FREEMAN. CHICAGO. CURIE HS CHESS CLUB. Affiliate Type: Scholastic. MON-THURS 3-6PM. CURIE HS . Contact: JOSEPH HOOKS. (773) 535 - 2140. CHICAGO. CARVER HS CHESS CLUB. Affiliate Type: Scholastic. Contact: LAWRENCE MIKOWSKI. (773) 535 - 5250. CHICAGO. HYDE PARK ACAD CHESS CLUB. Affiliate Type: Scholastic. T & TH 2:30-4:30. HYDE PARK . Contact: BILL WAGNER. (773) 535 - 0893. CHICAGO. BOWEN HS CHESS CLUB. Affiliate Type: Scholastic. TUES,THURS 3-5pm. Contact: ROBBY SINGER. (773) 535 - 6000. CHICAGO. FENGER ACAD CHESS CLUB. Affiliate Type: Scholastic. TUES-THURS 3-4:30. Contact: TYREE WOOLEY. (773) 535 - 5430. CHICAGO. MADERO MIDDLE SCH CHESS CLUB. Affiliate Type: Scholastic. FRI 8-9. Contact: RONALD HURLEY. (773) 535 - 4466. CHICAGO. CALUMET HS CHESS CLUB. Affiliate Type: Scholastic. T-W-TH 3-4:30PM. Contact: THOMAS CAMPBELL. (773) 535 - 3500. CHICAGO. BEST PRACTICE HS CHESS CLUB. Affiliate Type: Scholastic. Contact: MARAK FERTEL. (773) 534 - 7610. CHICAGO. DU SABLE HS CHESS CLUB. Affiliate Type: Scholastic. Contact: TOMMIE PEGUES. (773) 535 - 1100. CHICAGO. NASH KNIGHTS CHESS CLUB. Affiliate Type: Scholastic. M/W/F 3-6PM. NASH SCHOOL . Contact: H MICHAEL EINHORN. (773) 534 - 6125. CHICAGO. MICHELE CLARK SCH CHESS CLUB. Affiliate Type: Scholastic. 2:30-4:00. Contact: LESTER SANDERS. (773) 534 - 6250. CHICAGO. ARAI MIDDLE SCH CHESS CLUB. Affiliate Type: Scholastic. MONDAYS 2:30. Contact: JOHN BUKY. (773) 534 - 2610. CHICAGO. P REINBER SCH CHESS CLUB. Affiliate Type: Scholastic. Contact: TERESA PACYNIAK. (773) 534 - 3465. CHICAGO. HENRY CLAY ELEM CHESS CLUB. Affiliate Type: Scholastic. MON&WED 3-4PM. Contact: TOMAS BERDUSIS. (773) 535 - 5600. CHICAGO. DYETT SCHOOL CHESS CLUB. Affiliate Type: Scholastic. Contact: ALFRED DEAN. (773) 535 - 1825. CHICAGO. DOOLITTLE E MID SCH CHESS CLUB. Affiliate Type: Scholastic. TUES & THUR 2:30-3:30. Contact: ANN TORP. (773) 535 - 1040. CHICAGO. BRONZEVILLE SCH CHESS CLUB. Affiliate Type: Scholastic. Contact: SGT JAMES WIMES. (773) 535 - 0332. CHICAGO. VON STEUBEN HIGH SCHOOL. Affiliate Type: Scholastic. THUR 2:20-4:20. VON STEUBEN HS RM 421 . Contact: GIL DANIELS. (773) 534 - 5100. CHICAGO. JOHN L MARSH SCH CHESS CLUB. Affiliate Type: Scholastic. TUES 7:45AM,TH 2:30. LUNCHROOM MARSH SCH . Contact: DAVID ORELLANA. (773) 535 - 6430. CHICAGO. PROSSER CAREER ACAD CC. Affiliate Type: Scholastic. MON/WED 2:45-4:00. PROSSER ACAD . Contact: TARA POLLACK. (773) 534 - 3200. CHICAGO. WHITNEY YOUNG HIGH SCHOOL. Affiliate Type: Scholastic. TUES 3:30-5PM. WHITNEY YOUNG HS . Contact: ED DZIEDZIC. (773) 534 - 7059. CHICAGO. AMUNDSEN HIGH SCHOOL. Affiliate Type: Scholastic. T/THUR 2:30-4PM. AMUNDSEN HS . Contact: GERALD COLE. (773) 534 - 2320. CHICAGO. LENART RGC CHESS CLUB. Affiliate Type: Scholastic. THURS 1:30-2:30PM. LENART CPS . Contact: JOSE RODRIGUEZ. (773) 535 - 2322. CHICAGO. MORGAN PK HS CHESS CLUB. Affiliate Type: Scholastic. Contact: KENNETH DENTON. (773) 535 - 2550. CHICAGO. NORTHWEST MIDDLE SCHOOL. Affiliate Type: Scholastic. 8:30 AM-4:30 PM M-F. SAME . Contact: C/O MICHAEL J CORRIGAN. (773) 534 - 3250. CHICAGO. NORTHSIDE COLLEGE PREP HS. Affiliate Type: Scholastic. Contact: ELIZABETH RUNKEL. (773) 534 - 3954. CHICAGO. SOUTHSIDE COLLEGE PREP CC. Affiliate Type: Scholastic. Contact: GEORGE GOEWEY. (773) 535 - 9930. CHICAGO. SPALDING HS CHESS CLUB. Affiliate Type: Scholastic. Contact: GEORGE EWING. (773) 534 - 7400. CHICAGO. KENWOOD ACADEMY HS CC. Affiliate Type: Scholastic. Contact: C/O MARK YANAWAY. CHICAGO. PEIRCE SCH CHESS TEAM. Affiliate Type: Scholastic. Contact: C/O T WANBERG. CHICAGO. SENN HS CHESS CLUB. Affiliate Type: Scholastic. M-F 8-4. SENN HS . Contact: PETER NICHOLS. (773) 534 - 2365. CHICAGO. BEASLEY ACADEMIC CTR CC. Affiliate Type: Scholastic. DAILY APPROX 1 HR. VARIES . Contact: C/O LYNDIA GRAY. (773) 535 - 1245. CHICAGO. ROOSEVELT HS CHESS CLUB. Affiliate Type: Scholastic. TUES,THURS 3:30-5:30. ROOSEVELT HS . Contact: ADNAN SHAMOON. (773) 534 - 5000. CHICAGO. CPS CHESS K-12 ACADEMY CC. Affiliate Type: Scholastic. LAKE SHORE CAFE , 4900 S LAKE SHORE DR . Contact: THOMAS LARSON. (773) 538 - 6617. CHICAGO. LATIN SCHOOL OF CHICAGO. Affiliate Type: Scholastic. Contact: C/O BILL O'DONNELL. CHICAGO. JENSEN ACADEMY CC. Affiliate Type: Scholastic. THURS 1:30-2:30. JENSEN ACADEMY , 3030 W HARRISON . Contact: LESTER GOSS. (773) 534 - 6840. CHICAGO. LANE TECH HS CHESS TEAM. Affiliate Type: Scholastic. Contact: ERIC BASSETT. (773) 534 - 5400. CHICAGO. SCHURZ HIGH SCHOOL CC. Affiliate Type: Scholastic. Contact: MR SPIRUT. (773) 534 - 3420. CHICAGO. CHESS NUTS. Affiliate Type: Scholastic. TUESDAY 3:15-5:30 PM. ARCHBISHOP QUIGLEY , 103 EAST CHESTNUT , CHICAGO, IL 60611 . Contact: RAYMOND SCHUMAN. (312) 787 - 9343. CHICAGO. GALE ACADEMY CHESS CLUB. Affiliate Type: Scholastic. M-W-F 7:30-9. GALE ROOM 210 . Contact: VALENTINA HALLIDAY. (773) 534 - 2100. CHICAGO. PERSPECTIVES CHARTER SCH CC. Affiliate Type: Scholastic. THUR 3:30-5:30PM. SCHOOL . Contact: KEVIN HERATY. (312) 431 - 8770. CHICAGO. HIRSCH METRO HS CHESS CLUB. Affiliate Type: Scholastic. M-TH 2-5PM. SCHOOL . Contact: FLOYD GANT. (773) 535 - 3100. CHICAGO. JONES HS CHESS CLUB. Affiliate Type: Scholastic. FRI 7-8AM. JONES HS . Contact: PETER GRAFNER. (773) 534 - 8600. CHICAGO. KELLY HS CHESS CLUB. Affiliate Type: Scholastic. Contact: ATN: NEAL SUWE. CHICAGO. JUAREZ HS CHESS CLUB. Affiliate Type: Scholastic. M-F LUNCH PERIODS. JUAREZ HS . Contact: DANIEL SWANSON. (773) 521 - 1973. CHICAGO. ORR COMM ACAD HS CC. Affiliate Type: Scholastic. LUNCH PERIODS 5 DAYS. Contact: ROSIE CALHOUN. (773) 534 - 6500. CHICAGO. SIMEON CAREER ACAD CC. Affiliate Type: Scholastic. Contact: GREGORY STAPLETON. (773) 535 - 3200. CHICAGO. ENGLEWOOD ACADEMY CHESS EAGLES. Affiliate Type: Scholastic. Contact: JESSE GRANVILLE. (773) 535 - 3600. CHICAGO. HUBBARD HS CHESS CLUB. Affiliate Type: Scholastic. M-F 1-5pm. ROOM 217 . Contact: JOHN O'LEARY. (773) 535 - 2200. CHICAGO. LAKE VIEW HS CHESS CLUB. Affiliate Type: Scholastic. FRI 7:30-8:30AM. LAKE VIEW HS . Contact: MANUEL GONZALEZ. (773) 534 - 5440. CHICAGO. MATHER HS CHESS CLUB. Affiliate Type: Scholastic. FRI 1:30-4:00. MATHER HS . Contact: JONAS GLENN. (773) 534 - 2350. CHICAGO. METCALFE ACADEMY CHESS CLUB. Affiliate Type: Scholastic. Contact: CHARLES WATKINS. (773) 535 - 5590. CHICAGO. TILDEN HS CHESS CLUB. Affiliate Type: Scholastic. Contact: ATN: WILLIAM A SMITH. CHICAGO. WESTINGHOUSE CAREER ACAD CC. Affiliate Type: Scholastic. Contact: MARK JANKA. (773) 534 - 6400. CHICAGO. LOUIS ARMSTRONG CHESS CLUB. Affiliate Type: Scholastic. THURS 8-8:40. SAME . Contact: C/O JESSE ROOKS. (773) 534 - 6365. CHICAGO. AUSTIN COMM ACAD HS CC. Affiliate Type: Scholastic. M-F AFTER 3PM. AUSTIN HS . Contact: RICH DUNBAR. (773) 534 - 6300. CHICAGO. CANTER MIDDLE SCHOOL. Affiliate Type: Scholastic. Contact: CHESS CLUB. CHICAGO. CHICAGO HS FOR AGRICULTURAL SC. Affiliate Type: Scholastic. M-T-TH 1 HR 30 MIN. CHICAGO AG . Contact: LUIS ALVAREZ. (773) 535 - 2500. CHICAGO. ROBESON HIGH SCHOOL. Affiliate Type: Scholastic. Contact: CHESS CLUB. CHICAGO. CVCA JROTC CHESS CLUB. Affiliate Type: Scholastic. Contact: C/O ROBERT CHERNEY. CHICAGO. CHICAGO CHESS ACADEMY. Affiliate Type: Scholastic. SAT 9:30AM-12,MON 6:30-9:00PM. EDGEBROOK LIB , 5331 W DEVON , CHICAGO . Contact: MILAN MITROVIC. (773) 775 - 9101. CHICAGO. ST RITA HIGH SCHOOL. Affiliate Type: Scholastic. EXT 6509. Contact: CHESS CLUB / PHILIP CAMPOS. (773) 925 - 6600. CHICAGO. SOUTH SHORE HIGH SCHOOL. Affiliate Type: Scholastic. Contact: CHESS CLUB. CHICAGO. BELL SCHOOL CHESS CLUB. Affiliate Type: Scholastic. Contact: DANIEL LOVE GLAZER. (312) 534 - 5150. CHICAGO. WASHINGTON HS CC. Affiliate Type: Scholastic. Contact: C/O WARREN HOLMES. CHICAGO. HAWTHORNE CHESS CLUB. Affiliate Type: Scholastic. WED 3 PM. Contact: JULIE OSBORNE, RONNIE WALSH. (773) 477 - 1335. CHICAGO. BOGAN HIGH SCHOOL. Affiliate Type: Scholastic. CHICAGO. ST JOSEPH'S CHILD CENTER. Affiliate Type: Scholastic. Contact: C/O LES JOINTER. CHICAGO. CORLISS HIGH SCHOOL. Affiliate Type: Scholastic. Contact: CHESS CLUB. CHICAGO. COPERNICUS SCHOOL. Affiliate Type: Scholastic. Contact: CHESS CLUB. CHICAGO. DOOLITTLE WEST SCHOOL. Affiliate Type: Scholastic. Contact: CHESS CLUB. CHICAGO. DOUGLAS TAYLOR SCHOOL. Affiliate Type: Scholastic. Contact: CHESS CLUB. CHICAGO. FRANKLIN FINE ARTS. Affiliate Type: Scholastic. Contact: CHESS CLUB. CHICAGO. JULIAN HIGH SCHOOL. Affiliate Type: Scholastic. Contact: CHESS CLUB. CHICAGO. KING HIGH SCHOOL. Affiliate Type: Scholastic. Contact: CHESS CLUB. CHICAGO. MANIERRE SCHOOL. Affiliate Type: Scholastic. Contact: CHESS CLUB. CHICAGO. PARKMAN SCHOOL. Affiliate Type: Scholastic. Contact: CHESS CLUB. CHICAGO. BEAUBIEN SCHOOL. Affiliate Type: Scholastic. Contact: CHESS CLUB. CHICAGO. SEWARD SCHOOL CHESS CLUB. Affiliate Type: Scholastic. CHICAGO. MARQUETTE SCHOOL CHESS CLUB. Affiliate Type: Scholastic. Contact: C/O JOSE ROSALES. CHICAGO. DE PAUL PREP ACADEMY. Affiliate Type: Scholastic. Contact: C/O MATTHEW DITTO / 3139. CHICAGO. GAGE PARK CHESS CLUB. Affiliate Type: Scholastic. Contact: C/O THEO POULOS. CHICAGO. BRET HARTE SCHOOL CHESS CLUB. Affiliate Type: Scholastic. Contact: C/O MICHAEL METZ. CHICAGO. MANLEY SCHOOL CHESS CLUB. Affiliate Type: Scholastic. Contact: C/O TED CHRISTIAN. CHICAGO. WALTER PAYTON CP HIGH SCHOOL. Affiliate Type: Scholastic. Contact: CHESS CLUB. CHICAGO. PAYTON SCHOOL CHESS CLUB. Affiliate Type: Scholastic. Contact: C/O VIRGINIA M CUDECKI. CHICAGO. PHILLIPS SCHOOL CHESS CLUB. Affiliate Type: Scholastic. Contact: C/O LIMMIE BLAYLOCK. CHICAGO. CHICAGO CHESS KIDS. Affiliate Type: Scholastic. Contact: C/O MILAN MITROVIC. CHICAGO. DIXON ELEMENTARY SCHOOL. Affiliate Type: Scholastic. 12 NOON. SCHOOL . Contact: ANNETTE JACKSON. (773) 535 - 3834. CHICAGO. MARY GAGE PETERSON SCHOOL. Affiliate Type: Scholastic. Contact: C/O JOE KALLAS. CHICAGO. ST FERDINAND PARISH SCH CC. Affiliate Type: Scholastic. THUR 2:30-3:30PM. ST FERDINAND LIB . Contact: JERRY MOLITOR. CHICAGO. SABIN MAGNET SCHOOL. Affiliate Type: Scholastic. Contact: ERIN ROCHE. (773) 534 - 4491. CHICAGO. CHESS IN CHICAGO FOUNDATION. Affiliate Type: Scholastic. -. Contact: LAMARR WILSON. email: lawilson@chessinchicago.org. www.chessinchicago.org. 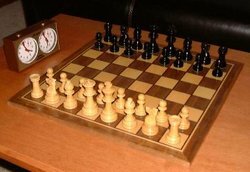 This club offers: USCF Rated Events , Leagues , Casual Play , Equipment , Lessons , Beginners Welcomed Additional Information: Chess in Chicago is a website. CHICGO. ARIEL COMMUNITY CHESS CLUB. Affiliate Type: Scholastic. Contact: C/O CLIFFORD WALKER. CRYSTAL LAKE. THE CENTER CHESS CLUB. Affiliate Type: Regular. 3RD SAT 8AM-4PM. CRYSTAL LAKE PK DIST , 1 E CRYSTAL LAKE AVE . Contact: C/O JEFFERY I BUCHMAN. (815) 455 - 5288. CRYSTAL LAKE. COMMUNITY CONSOLIDATED. Affiliate Type: Scholastic. Contact: SCHOOL DISTRICT #47. DANVILLE. DANVILLE CORR CENTER. Affiliate Type: Prison. Contact: ATTN CHESS CLUB. DARIEN. INDIAN PRAIRIE PUB LIBRARY. Affiliate Type: Regular. Contact: GENERAL DEPT. DARIEN. CASS JR HIGH SCHOOL. Affiliate Type: Scholastic. Contact: N ALSOBROOK. DES PLAINES. FOREST SCH KNIGHTS OF THE FOR. Affiliate Type: Scholastic. 3:30-4:30. SAME . Contact: C/O JACK SHEPHERD. (847) 824 - 1380. DOWNS. TRI-VALLEY VIKING CHESS CLUB. Affiliate Type: Scholastic. TUES 3:15-4:15. TRI VALLEY ELEM SCHOOL . Contact: ROBIN SHAFFER. (309) 378 - 3414. EAST ST LOUIS. EAST ST LOUIS SCHOOL DIST. Affiliate Type: Scholastic. Contact: ATTN DR DEAR. EVANSTON. ST JOAN OF ARC. Affiliate Type: Scholastic. Contact: C/O MONICA RICHTSMEIER. FLOSSMOOR. CHESS ACADEMICS ACADEMY. Affiliate Type: Scholastic. Contact: C/O MILTONI CASTON. FLOSSMOOR. HOMEWOOD-FLOSSMOOR HIGH SCH. Affiliate Type: Scholastic. TUES - 4-7PM. RM 263N . Contact: CHESS CLUB C/O JOHN SCHMIDT. GALESBURG. COSTA CATHOLIC SCH CHESS MSTR. Affiliate Type: Scholastic. 2:30-3:30 FRIDAYS. COSTA CATHOLIC SCHOOL , 2726 COSTA DR , GALESBURY, IL . Contact: GARY ARMSTRONG. (309) 343 - 8832. GENEVA. GENEVA PUBLIC SCHOOLS. Affiliate Type: Scholastic. MONDAYS 3:30-4:30. GENEVA MIDDLE SCHOOL , 1415 VIKING DRIVE . Contact: C/O JUDY HART. (630) 463 - 3081. GLEN ELLYN. HADLEY JR HIGH SCHOOL. Affiliate Type: Scholastic. Contact: MIKE MIELE. (630) 790 - 6450. GURNEE. CHESS CENTRAL. Affiliate Type: Regular. Contact: TIM JUST. (847) 244 - 7954. GURNEE. ILLINOIS CHESS ASSOCIATION. Affiliate Type: State. Contact: TIM JUST. (847) 244 - 7954. www.illinoischess.org. HIGHLAND PARK. MICHAEL BILOW CHESS CLUB. Affiliate Type: Regular. Contact: C/O MICHAEL BILLOW. (847) 831 - 4829. HOFFMAN ESTATES. MACARTHUR SCHOOL CHESS CLUB. Affiliate Type: Scholastic. MON 3-4:30PM. MACARTHUR SCH , HOFFMAN EST IL 60195 . Contact: GRACE PASIK. (847) 885 - 6776. LA SALLE. LA SALLE PERU TOWNSHP HS CC. Affiliate Type: Scholastic. THURS AFTER SCHOOL. SCHOOL CAFTERIA , 541 CHARTRES ST . Contact: BYRON PAPPAS. (815) 223 - 1505. LANSING. OAK GLEN ELEM CHESS CLUB. Affiliate Type: Scholastic. TUES/WED/THUR 12-1PM. OAK GLEN ELEM SCH . Contact: LISA GIGLIO. (708) 474 - 1714. MAHOMET. ILLINI CHESS FOUNDATION. Affiliate Type: College. TUES 7-10PM. ILLINI UNION , UNIV OF ILLINOIS . Contact: JEFF DAVIS. (217) 586 - 5888. MORTON GROVE. CHICAGO CHESS CLUB. Affiliate Type: Regular. THR-SUN 7-11PM. WILD ONION CC , 6136 N CLARK , CHICAGO IL 60660 . Contact: TOM KIRKE. (312) 996 - 7220. MORTON GROVE. THOMAS A EDISON ELEMENTARY. Affiliate Type: Scholastic. (EXT 1241). Contact: JIM O'MALLEY. (847) 966 - 6210. MT PROSPECT. RIVER TRAILS CHESS CLUB. Affiliate Type: Scholastic. THURS., 3-3:50 PM. RIVER TRAILS MIDDLE SCHOOL , 1000 WOLF RD . Contact: TOM HARMON. (815) 459 - 6558. MURPHYSBORO. MURPHYSBORO CHESS CLUB. Affiliate Type: Regular. TUES 7-10PM. MURPHYSBORO HARDEES RESTAURANT , INTERSECTION OF RT 13 & WALNUT . Contact: TOM EATON. (618) 565 - 1809. NEW LENOX. LINCOLN-WAY CENTRAL HS CC. Affiliate Type: Scholastic. Contact: C/O KEVIN DAILEY. NORMAL. PRAIRIELAND/COUGAR CHESS CLUB. Affiliate Type: Scholastic. Contact: PAMELA CATHER. (309) 452 - 9262. NORMAL. GLENN ELEMENTARY SCHOOL. Affiliate Type: Scholastic. WED 3:15-4:15. GLENN ELEMENTARY SCHOOL . Contact: JAN MEADOWS. NORMAL. COLENE HOOSE ELEM SCHOOL. Affiliate Type: Scholastic. MONT 3:15-4:15. COLENE MOOSE ELEM SCHOOL . Contact: JAN MEADOWS. (309) 452 - 1149. NORMAL. PARKSIDE JR HIGH SCHOOL. Affiliate Type: Scholastic. MON 3:30PM. PJHS , 101 N PARKSIDE DR . Contact: KELLY LYLE. (309) 452 - 8321. NORMAL. CHIDDIX JHS CHESS CLUB. Affiliate Type: Scholastic. WED 3:30-4:30. SAME . Contact: TOM FINCH. (309) 452 - 1191. OAK PARK. WHITTIER'S STARRY KNIGHT. Affiliate Type: Scholastic. THURSDAYS 3-4 PM. SCHOOL (715 N HARVEY) . Contact: WYATT PATTERSON. (708) 524 - 3080. PALATINE. PALATINE HIGH SCHOOL. Affiliate Type: Scholastic. Contact: RON SLOAN. (847) 755 - 1742. PALATINE. WINSTON CAMPUS JR HIGH SCHOOL. Affiliate Type: Scholastic. WED 2:30-4PM. SCHOOL . Contact: HARRY SCHOFFSTALL. (847) 963 - 7479. PARK FOREST. PARK FOREST CHESS CLUB. Affiliate Type: Regular. THURS 7-10PM. FREEDOM HALL , 410 LAKEWOOD BLVD , PARK FOREST,IL 60466 . Contact: LARRY COHEN. (630) 834 - 2477. email: lscohen60@yahoo.com. http://www.tuxdomain.com/pfcc_club.html. PARK FOREST. FOREST TRAIL MIDDLE SCHOOL. Affiliate Type: Scholastic. Contact: C/O GENE FINLEY. PARK RIDGE. CAVEMAN CHESS CLUB. Affiliate Type: Regular. FRI 5-7 PM. EMERSON M S , 8101 N CUMBERLAND , NILES, IL . Contact: KEVIN L BACHLER. (847) 698 - 9365. PEORIA. GREATER PEORIA CHESS FED. Affiliate Type: Regular. MON 7-11 PM. PEORIA LAKEVIEW MUSEUM , 1125 WEST LAKE AVE , PEORIA,IL . Contact: WAYNE ZIMMERLE. (309) 686 - 0192. PEORIA. NEW MORNINGSTAR CHESS CIRCLE. Affiliate Type: Regular. Contact: C/O CLARENCE WALTON. PLAINFIELD. PLAINFIELD LIBRARY CHESS CLUB. Affiliate Type: Regular. SAT 1:30-2:30PM. PLAINFIELD PUB LIB , 705 N ILLINOIS ST , PLAINFIELD IL 60544 . Contact: CEIL CAREY. (815) 439 - 2877. QUINCY. QUINCY CHESS CLUB. Affiliate Type: Regular. TUESDAY 7-10 PM. GOOD SAMARITAN HOME , 2130 HARRISON , QUINCY,IL 62301 . Contact: GARY L BLICKHAN. (217) 223 - 8762. email: gblickh@adams.net. www.adams.net/~gblickh/index.htm. ROCKFORD. ROCKFORD CHESS ASSOCIATION. Affiliate Type: Regular. 6:30-10 MONDAYS. BORDERS BOOKS,MUSIC, & CAFE , EAST STATE ST & PERRYVILLE AVE , ROCKFORD, IL . Contact: GARY SARGENT. (815) 397 - 9186. email: bmreed98@mail.com. ROCKFORD. MARTIN LUTHER KING SCH CHESS C. Affiliate Type: Scholastic. Contact: ALEXANDER TRAUTMANN. (815) 962 - 3157. ROSELLE. SATURDAY KNIGHT CHESS CLUB. Affiliate Type: Regular. Contact: C/O ADAM WIDELKA. SKOKIE. LINCOLN JUNIOR HIGH SCHOOL. Affiliate Type: Scholastic. SCHOOL . Contact: ERICH GRAUKE. (847) 676 - 3545. SKOKIE. SHALOM SUNDAY SCHOOL. Affiliate Type: Scholastic. 11:30-1:15 SUNDAYS. 3003 N TOUHY, CHICAGO & , 1250 RADCLIFFE RD, BUFFALO , GROVE, IL . Contact: SVETLANA PRITZKER. (847) 675 - 2200. SKOKIE. HIGHLAND SCHOOL CHESS CLUB. Affiliate Type: Scholastic. Contact: MARK STEIN. (847) 676 - 9380. SKOKIE. OLD ORCHARD JUNIOR HS. Affiliate Type: Scholastic. Contact: MARK STEIN. (847) 470 - 0591. STILLMAN VALLEY. STILLMAN VALLEY HS CC. Affiliate Type: Scholastic. 2-4PM. STILLMAN VALLEY HS . Contact: PHIL BRATTA. (815) 645 - 2291. STREAMWOOD. POPLAR CREEK PUBLIC LIB DIST. Affiliate Type: Scholastic. STREAMWOOD. ST PETER'S SHINING KNIGHTS. Affiliate Type: Scholastic. TUESDAYS 2:30-4:00. ST PETER LUTHERAN SCHOOL , 208 E SCHAUMBURG RD , SCHAUMBURG, IL 60194 . Contact: JAIN JONKE. (847) 885 - 7636. SWANSEA. WOLF BRANCH SCHOOL. Affiliate Type: Scholastic. THURSDAY 3-5 PM. SCHOOL , SAME AS MAILING . Contact: PAUL D PETERSON. (618) 277 - 2100. WASHINGTON. WASHINGTON GR SCH DIST 52 CC. Affiliate Type: Scholastic. TUES 6:30PM- 8PM. LINCOLN GRADE SCHOOL . Contact: LISA STRICKLAND. (309) 444 - 8559. WEST CHICAGO. BENJAMIN SCHOOL DIST #25. Affiliate Type: Scholastic. MON 7-8:30. BENJAMIN SCHOOL . Contact: SANDY MACHAJ. (630) 293 - 5080. WESTERN SPRINGS. AMERICAN POSTAL CHESS TNMTS. Affiliate Type: Regular. Contact: HELEN WARREN. (630) 663 - 0688. WHEATON. LONGFELLOW ELEMENTARY SCHOOL. Affiliate Type: Scholastic. Contact: CHESS CLUB C/O FREDERICK ECK. WHEATON. MADISON CHESS CLUB. Affiliate Type: Scholastic. Contact: C/O CHRLIE CORNELIUS. (630) 682 - 1341. WINNETKA. BLUE WYVERN CHESS. Affiliate Type: Regular. Contact: C/O TOM SPRANDEL. WINNETKA. NEW TRIER EXTENSION CC. Affiliate Type: Scholastic. Contact: C/O TOM SPRANDEL.